The best newest hot dog hits NYC tonight. The Stupak Dog is the latest ode to a star chef to go on the menu at the legendary bar PDT. Now that we’re all officially sick of leftover turkey, it’s time to turn our attention to food that has nothing whatsoever to do with the holidays: hot dogs. 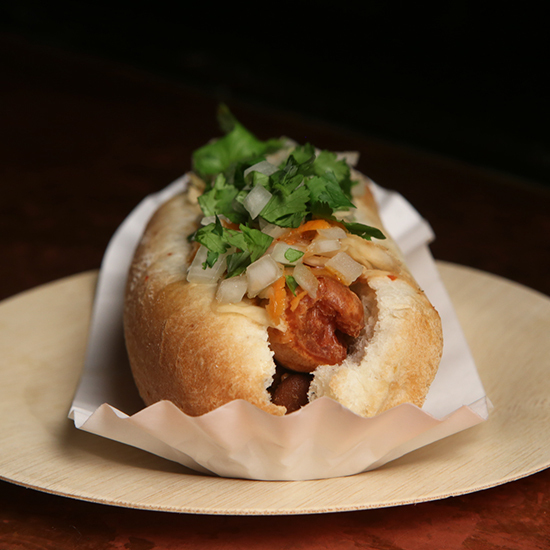 The best, newest hot dog hits NYC tonight. The Stupak Dog is the latest ode to a star chef to go on the menu at the legendary bar PDT. It also serves as a welcome to Alex Stupak, who recently opened Empellon Al Pastor down the block from PDT. At Al Pastor, Stupak is serving outrageous tacos, namely the signature al pastor taco made with marinated spit-roasted pork and pineapple. PDT's Stupak Dog features a deep-fried Crif Dog's hot dog topped with spicy pickled cabbage, salsa de arbol and Drunken Black Beans. Like all the best neighbors, PDT’s new bar manager Jeff Bell created a cocktail in honor of Empellon Al Pastor. The Pils Al Pastor is a mix of tequila, pineapple drinking vinegar and chile liqueur. It happens to pair perfectly with the Stupak Dog.